The garage is supposed to be the area in your home where you can safely and securely keep your car when you're not using it. Due to its size, most homeowners use this as an additional storage area whether or not the car is inside it. When homeowners can't seem to stop themselves from storing things in their garage, it will soon be full of various items that they won't be able to park their car inside it. There really is nothing wrong with storing some of your possessions in the garage. The big problem comes when it becomes too cluttered and full of items that you can't fit your car and you can't store your automotive tool and gears inside it. Divide your garage into different areas. Assign certain zones into your garage where you should store items under the same category such as gardening, carpentry, sports, and automotive. This way, you know where to get the item immediately so you won't have to rummage through everything every time you're looking for something. Remove all the items on the floor. Invest in the right garage storage items such as cabinets, drawers, and shelves. They come in different sizes and shapes so you'll find the best ones you can use to store items per category as well. Get a drawer and cabinet to store all your car tools and equipment. Get another set for your gardening tools and sports stuff, too. You'll be able to get rid of all the clutter on the floor, organize everything that's inside the garage, and have more space for your car. You can also use this space to work on your car when you need to. Maximize the walls. Have slatwall panels installed so that you will have a good use for your walls as well. You can also simply install hooks on the wall so that you can hang some items on them and get rid of more clutter on the wall. Use a trolley or utility cart to keep car accessories and tools you regularly use. Whenever you're working on or cleaning your car, the wheeled car is easy to maneuver and you can push it wherever you want to place it. For a fast and easy car cleanup, make sure the cart always has some chamois, cleaners, and squeegees or foams. There is a wide array of benefits and advantages to installing garage overhead storage products. You will be able to make much better use of your space, while clearing up unnecessary clutter. Additionally there are no trade offs you need to make in return, and you can accomplish everything you'd like for a low cost. Be sure to make your choice based on your needs and you'll end up with garage overhead storage products that are perfect for what you're looking for. One of the great benefits to these storage systems is that they are very versatile and functional. 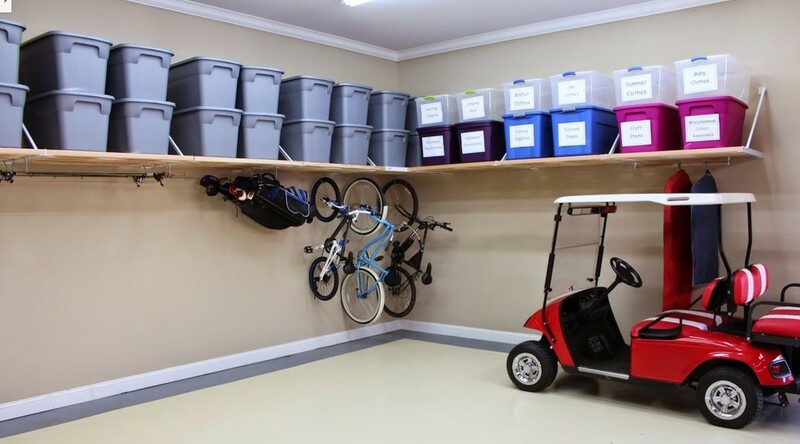 You can really store many different items, which will help you clear up the floor in your garage once and for all. It will also enable you to move items from other areas of your home into the garage where they belong, therefore improving your living space. Many people use overhead storage units for bicycle storage. It's easy to hang them from many different styles of shelving or hanging units. Some overhead products are made specifically to hang bicycles, while others can be used just the same to hang them up. Another great benefit to these products is that many of them come with an automatic lift system. This makes it easy to store heavy and large objects overhead where they are out of the way, while still enabling you to easily access them when you need to. Of course, many systems don't move or lift, and instead are stable overhead racks or shelves. Therefore you really need to think ahead of time for what you will be storing, how easily you'll be able to move everything and how accessible you need it to be. In addition to these benefits and many more, there are some other important things that you'll have to think about. For example, you need to consider the budget that you're working with. Spending a few hundred dollars will enable you to get most garage overhead storage products. However, if you're looking for more complex or heavy duty gear, or if you need multiple units, you'll need to be willing to spend more. Installation shouldn't be difficult but considering the location of the solutions that you'll be using, you may want to consider getting some help to complete the job. You need to make sure everything is secured properly so that you don't have a costly and dangerous accident down the line. Finding the exact location that makes sense for the product may also be a bit tricky, so remember to plan accordingly and to get help if you need to. There are many different benefits to garage overhead storage products, including that you get to clear up a lot of clutter without losing anything in return, and there are different products to store many different items. It's one of the easiest ways to utilize your garage space more appropriately and fully, and many homeowners now pursue it. Read more about garage overhead storage products [http://www.garagestoragemarket.com/garage-overhead-storage-products.html]. Visit Garage Storage Market [http://www.garagestoragemarket.com/]. Garages have become a catch-all for extra items. Boxes of holiday decorations and seasonal equipment you are not ready to part with may crowd the area. If you plan to use the area as a workshop for your hobbies, tools and supplies can quickly clutter the space. Custom garage cabinets can help you regain some order in your workspace. The beauty of custom garage cabinets is that the design fits not only your space but also your needs. If you like to work with wood or metal, you will need some sort of bench that integrates right into the cabinetry. This allows you to have your surface area while keeping all your items within easy reach. A pegboard hangs beneath the top cabinetry and above the workspace. In some instances, you may not need a worktable. Instead, you need some place to hang yard tools, bikes, and sporting equipment. Floor-to-ceiling pegboards give you the flexibility to organize your tools and sports equipment how you see fit. You can get custom storage systems on just about any budget. It all depends on the materials and the size of the overall system. It is not a quick process, and it can take several days for the manufacturer to complete and install each piece. Despite the fact that you may have to wait, what you get in return is quality you cannot find in a big box store. Some establishments market these systems as garage cabinets. However, it is better to use these materials in home closets. The design is not for the daily climates found in most garages. They easily wear out, and replacement is necessary within just a few months to a few years. Storage systems designed for your space use tougher material and seal it with a powder coat that makes it resistant to UV light, dents, scratches, and stains. The design lasts for years, even when you use it daily. Garage cabinets come in wood or metal. Both substances have their benefits and their drawbacks. The one you choose ultimately depends on your needs, budget, and tastes. With wood, you have the advantage of more sizes and shapes than you do with metal. You also have a wider variety of powder coat colors from which to choose. The majority of these systems use a medium density fiberboard (MDF), which is strong and dense. Its use creates a long-lasting unit. What you need to look for is a system that has a protective finish. Those without this finish will not last as long and are not as durable in areas that are not temperature controlled. Metal, on the other hand, doesn't have to reside in a temperature-controlled environment. The design is for use in extreme conditions. Higher-grade systems often come with a rust-resistant finish. They also do not warp when exposed to water or high heat. You can choose from aluminum, mid-grade steel, and high-grade steel. Aluminum design is for use in trailers; however, it is popular in garages due to its rust resistance and durability. It is soft and can dent easily. Mid-grade steel is the most popular type found in big-box stores. While it is more durable than aluminum, the doors are still prone to dents and dings. High-grade steel gives you the best quality. The doors are less likely to dent, and they come with double wall steel construction. Sadly, these units are very expensive. Garage cabinets are a great way to maintain order. The variety and flexibility give you many options from which to choose. When considering garage cabinets, Sacramento residents visit 3 Day Closets. Learn more at http://www.sacramentocustomclosets.com/media-centers/. Quick Tips for garage organization and storage. Completely clean out the garage and move it into the driveway or yard. Go through each item and decide when was the last time you used it. It's a good idea to organize your items into 3 groups at this time. Frequently used items should be quickly accessible in the garage on low storage, items that you use occasionally should be stored higher and more out of the way and items you haven't used it in over a year, get rid of them. Your garage is an expensive room but most people don't treat it that way. If you treat it like any other room in the house it's worth the time to draw up a plan. Just as you would for your kitchen or bonus room take measurements and put your plan down on paper. Decide what items that you store in the garage but use in the house. Keep those items nearest the door into the house. The big items like a lawn mower, pressure washer or snowblow should be stored under a shelf so they don't take up as much room. Storing them in the corner is a waste of space and also makes keeping the floor clean much more difficult. Get your string trimmers, weed eater, shovels and rakes off the floor and onto a storage system. There are many systems available to help store these items. Ideally everything should be stored off the floor. Keeping things in a cabinet, on a garage shelf or in a container not only lets you get them off the floor but keeps them clean. Not only does it keep your items clean but it makes keep the floor clean a breeze as well. Shelving is ideal for items that you need to grab quickly or when you will have your hands full. Your garage most likely contains hazardous materials like fertilizers, pesticides, and paint. Keep those up high and out of reach or keep them locked in a garage cabinet. It also a good idea to keep your sharp gardening tools and your chainsaw in locked cabinet or up high on a garage shelf. The one item that you should never be without is a fire extinguisher. Your garage most likely has many flammable items so make sure you are covered if a fire starts. Bill Garvin is the owner of Garage Storage Specialists, a Garage Storage company serving the Nashville, Tn area. Bill and his team can help you with getting your garage organized with their lines of garage storage systems. Depend on Garage Shapeups for all of your garage storage organization needs For a Free Estimate call 1-800-256-4969. Visit GarageShapeups,com now. Are you tired of tripping over the mess in your garage because things are all over the floor? Slatwall is a great product that can help you by getting your items off the floor and on the wall, leveraging the wall space you already have. Slatwall is actually paneling that you attach to your garage walls, which then allows you to hang everything and anything on the walls. the paneling attaches to either your exposed beams in your walls or applied over your existing drywall. 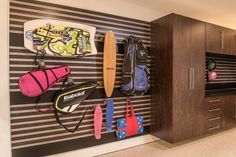 The beauty of this product is that it turns your garage walls into a flexible, modular organizational system and the best part is that slatwall accessories are not permanent. Simply slide standard slatwall accessories (hooks, racks, shelves, cabinets) into the paneling grooves on the wall. If you need to make a change, slide the accessory off the wall and move it elsewhere. You will never have to put another hole in a garage wall again. Specifically designed for the rugged, moist environment of the garage, slatwall paneling for the garage is different from the particleboard paneling used in many retail stores. Particleboard is OK for applications like retail stores because the environment is controlled. Always 75 degrees and you never have to deal with moisture. However that is not your garage. Garages are normally not heated and air conditioned and on the rare occasion they are, all your hard work in controlling the temperature is lost the minute you open the garage door. Slatwall for the garage is made from cellular PVC, that is fire retardant, waterproof, bug proof and can hold approximately 50 pounds per hook. Particle-board paneling can't say any of this. Is is available in multiple colors including a wood-grain option. And when you want to clean it, you just squirt it down with a hose. It's just that simple. ​So the next time you trip over something in the garage, don't get mad, get slatwall, it's the 21st century pegboard. Gus Gougas is presently an partner and president of OrganizIT!, a Chatsworth based business that provides products and services within the garage remodeling/organization industry. 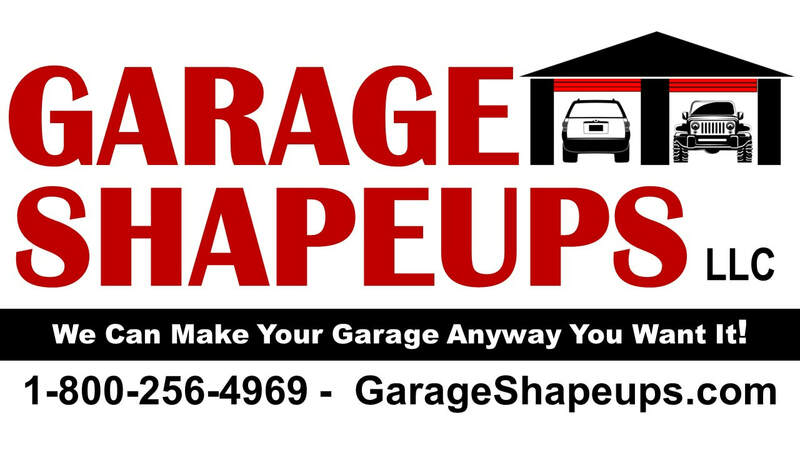 Huntsville Garage Shapeups is a member of the Garage Shapeups, LLc home improvement business group. Check out the other home improvement services we provide at the following websites: GarageShapeups.com, LifeTimeEpoxyFloors.com, PoolDeckRescue.com, RubaSafe.com For more information on any of these services or to schedule a free, no obligation, estimate, call 1-800-214-4311. 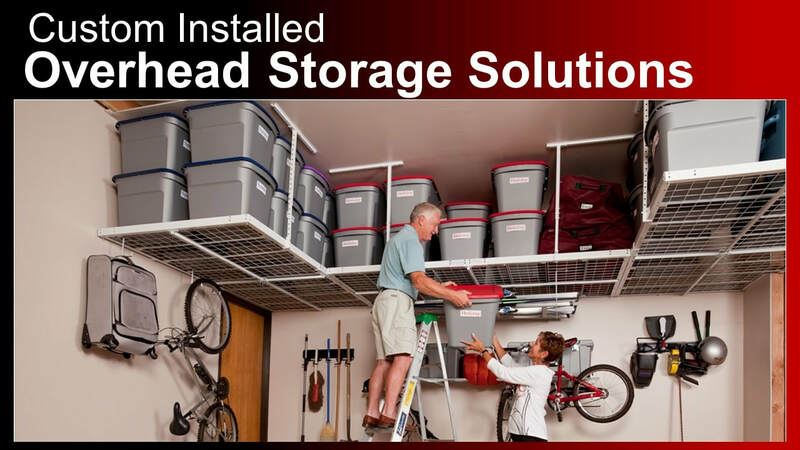 ​Read more about garage overhead storage products [http://www.garagestoragemarket.com/garage-overhead-storage-products.html]. Visit Garage Storage Market [http://www.garagestoragemarket.com/]. Organizing your garage is not difficult when you have appropriate garage storage options. Since there are numerous types of options available in the market you can simply pick the kind of solutions for storage which are best suited for your garage. If you need to store different kinds of items like tools then you need to purchase your storage options accordingly. Storing tools can be easy if you choose different methods like slat wall or tool racks. Small tools can be stored well using the pegboards. For longer tools or power tools you have to use good racks which can store different kinds of items. If you have a lot of gardening tools they can be organized using different types of storage racks. Some of them are wall mounts while you can also find free standing varieties. Before you purchase your garage storage devices it is a good idea to make a plan. First, decide how you will be using the space. Look at the space available in the area and then decide what kind of space is available for using. Check the wall and ceiling space and see how you can make use of them. You can use different kinds of wall mount storage options for storing different materials. Once you know how much additional space is available you will be able to allot the new space for storage. When you know how much space is available it is easy to purchase the kind of storage you need according to the space. If you do not wish to use the floor space then consider your wall and ceiling. You can use steel grids, peg wall and slot wall to hang various kinds of items including your sporting goods and garden supplies. You can save the floor space too. Things which cannot be stored on the walls can be kept in shelves. You can purchase racks or shelves for storing items which are used frequently. After getting an idea of using the space appropriately, purchase the garage storage options accordingly. When you are ready with the items you can begin organizing your garage. First, check the various items you have inside. Divide them into useful and not useful items. If possible you can donate some materials which you do not use or throw away the others which are useless. In this way you can save a lot of space. When the sorting out is complete it is time to place all the objects in their appropriate places. Make sure that you clear all the clutter and keep your garage neatly organized. Whenever you take out any item for usage, ensure that you place it back in its place. This can help you to maintain your garage in a neat and clutter-free way. Are you trying to make your garage into a place where you can work or enjoy your hobbies? 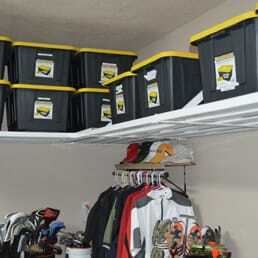 Be sure to visit my site for tips on garage storage [http://guysgarage.com/] and garage organization [http://guysgarage.com/garage_organization.html].